← Are you a Gooseberry Patch Fan? I have never tried my hand at making jam but I have such an abundance of beautiful strawberries that I wanted to give it a whirl. 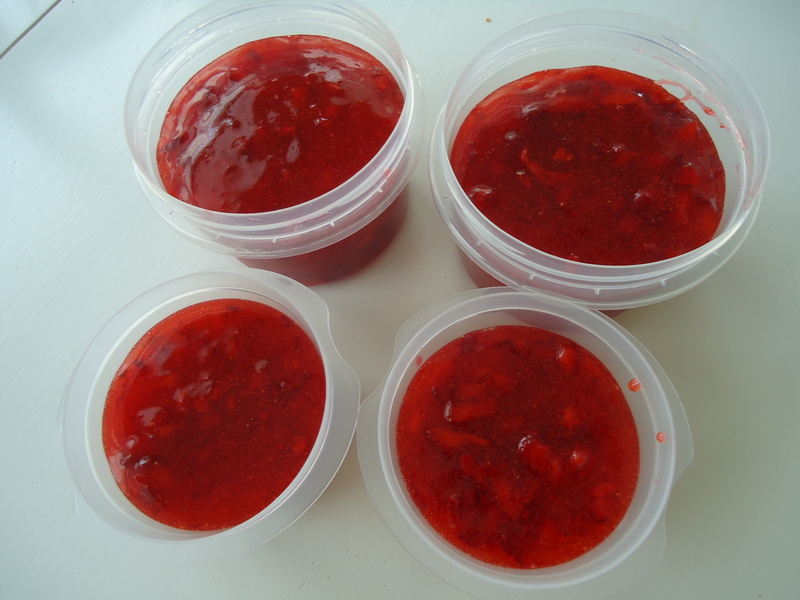 Not wanting to invest in canning equipment at this point, I tried the recipe in the Sure Jell pectin package for freezer strawberry jam. This recipe is SO easy to make. But even better it’s delicious. The jam bursts with fruit flavor and has bits of fresh fruit in each bite. The nice thing about this jam is it sets up quickly even though the recipe recommends to set on the counter for 24 hours. Just be sure to keep it on the counter for that 24 hours! No testing! This keeps in the refrigerator for 3 weeks or you can freeze it for up to 1 year. Thaw it in the refrigerator overnight. Now, a few notes about the recipe: I don’t own a potato masher. Yes, you read that right…no potato masher in my house. (I use a ricer.) So I used a pastry cutter. It worked very well chopping up the berries. You don’t want really big pieces. Your other option is to use a food processor but mine is broken and I’ve not yet bought a new one. If all you have is glass jars, use them. It will be fine. What I froze was in plastic while the gifts I gave were in glass. I had a small collection of smaller jelly jars and used those. You don’t have to spend a lot of money on jars. An important note, according to the Sure-Jell folks…use the exact amount of sugar called for in the recipe. Using less or a sugar substitute will result in set up failures. Sure-Jell offers a product for less or no sugar recipes. Check your store or their website. Click on the link above for information. Now, a note about my experience: When I set out to make my second batch, I sent my wonderful husband to the store for more Sure-Jell powdered fruit pectin. Well, he came home with the Certo Sure-Jell in a blue package. This is a liquid and eliminates the stove top step of dissolving the powdered version. Both jams turned out beautifully and are equally delicious. The recipe below is for using the powdered, yellow box Sure-Jell. Wash and rinse plastic or glass containers with tight-fitting lids. Use 1 to 2 cup size containers. Discard stems on strawberries and crush berries, 1 cup at a time, in a mixing bowl. If using a food processor, chop the berries, do not puree. Measure exact amount of sugar into separate bowl. Stir sugar into prepared fruit, mixing well. Let stand for 10 minutes, stirring occasionally. In a small saucepan, stir 1 box pectin and 3/4 cup water. Bring to a boil on high heat, stirring constantly. Boil 1 minute, stirring constantly. Remove from heat. Stir pectin mixture into fruit mixture, stirring constantly until sugar is completely dissolved and no longer grainy, about 3 minutes. A few sugar crystals may remain. Let stand at room temperature 24 hours until set. Refrigerate up to 3 weeks. Otherwise store in freezer for up to 1 year. Thaw in refrigerator. Recipe courtesy of Sure-Jell premium fruit pectin. This entry was posted in Favorite Things, Makes A Great Gift. Bookmark the permalink.